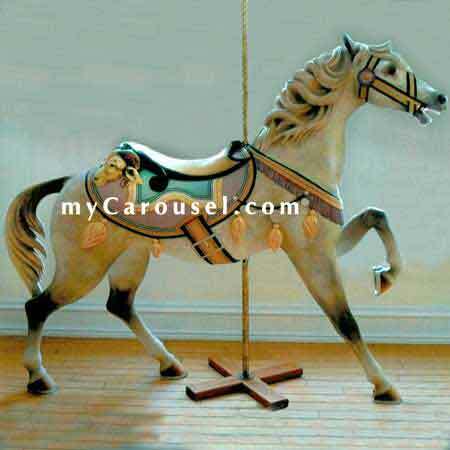 Turn of the century stander from the Philadelphia carousel works of E. Joy Morris. The striding outside row horse with a refined head on a neck crested with a tousled mane in high relief is furnished with a fringed breastband securing the double blanket saddle. The horse is further decorated with a rope of disks and tassels and carries a ram's head behind the cantle. Beautiful restoration. 58 long x 56 high.